Healthcom provides services through hospitals and homecare agencies nationwide. Click here to contact us and to find a service provider near you. More and more, seniors are enjoying longer, more independent lives in their own homes. Healthcom is helping family members assist each other and stay connected with all generations of their family. Healthcom delivers wide variety of services for clients and their family members. Through a comprehensive line of monitoring technologies, customizable response services and automatic alert notifications, we help your active population maintain their freedom while ensuring their safety and security. Ultimately, it’s about providing the best quality of life for everyone – that’s the Healthcom commitment. If you are interested in learning more about CareLink medical alert service or to order online, click here. Through Healthcom’s services, all family members can feel comfortable knowing that if a need arises, the right help can be automatically notified 24 hours a day, 7 days a week. Multiple family members can be alerted through the Family Access Anywhere website via phone, email or text messaging. Best of all, professional, caring attendants are available to ensure the right help responds quickly. Healthcom’s caring attendants are trained to quickly and professionally determine the nature and severity of any in-home emergency. They will contact the appropriate responder and notify the appropriate family members in the event of an emergency. In most cases, the attendant will even stay on the line with the client until help arrives. Our proactive monitoring services also look for AC losses, low batteries and other potential hazardous events. This helps to ensure that help can be called when it’s needed the most. 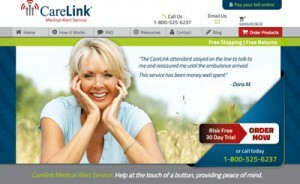 Medical Alert – Which CareLink system is right for me?